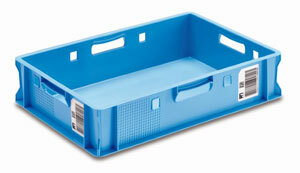 Meat containers E-Performance. Order directly from our online shop | George Utz Ltd. This new meat container replaces the red container that has been used millions of times on the market. Four in mould labels with container identification and GS1 code permit the containers unique identity. 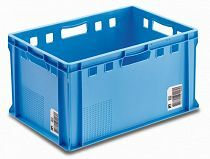 The light blue colour guarantees that only new material is used for the production of these containers.